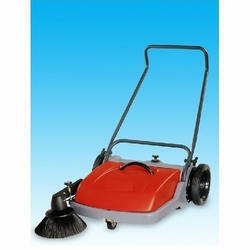 Our product range includes a wide range of manual sweeper machine. Our product range is inclusive of Manual Sweeper Machine that are made using quality material sourced from trusted vendors of the market. These are known for durability, resistivity to adverse conditions and tensile strength, which in turn make us one of the leading exporters of the country. Repeat orders are given for these at national and international level as the performance delivered by the sweepers is unmatched. Furthermore, highly affordable prices make these lucrative for clients. Looking for Manual Sweeper Machine ?